<-> Click here to enlarge. With ten number bands on each of two rows it may imprint up to 20 digits of alpha/numeric data. It is easy to load & use. 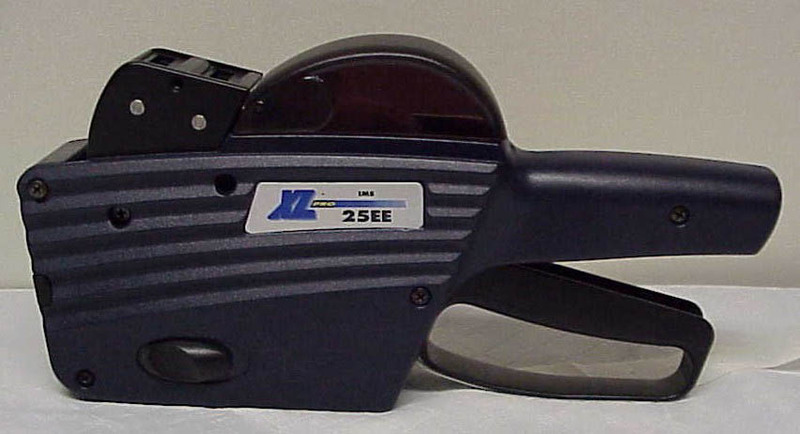 TXM25-10A-10A hand-held loaded labeler weighs less than 15 oz., has a five year written warranty & uses the popular 2516 label (1" x 5/8" size). This labeler may be used by libraries wanting to imprint not only the LEVEL & POINTS on their reading program labels, but the DISC# & TEST#, & or Lexile number as well. It also imprints the 2516 size Look For! labels with the quantities for each type of part. Ideal for marking sku numbers on products from various manufacturers to facilitate reordering and inventory.